Go to original pattern for design DROPS 37-7. DROPS jacket with pattern borders in “Paris”. 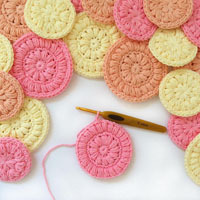 Size S – L.
DROPS circular and double pointed needles size 3.5 mm and 5 mm - or size needed to obtain 17 sts x 22 rows in stocking st on needle size 5 mm/US 8 = 10 x 10 cm. Pattern: See diagram. The diagram shows the pattern from the RS. 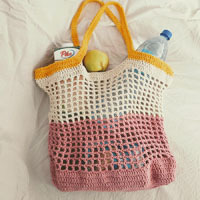 and the entire pattern is worked in stockinette st. Edge: Work 3 cm / 1'' stockinette st with blue, change to coral, P 1 row (= folding edge, measure piece from here), work M.1, change to blue, work 2.5 cm / 7/8'' stockinette st. 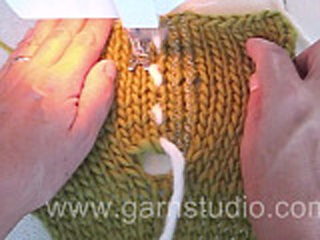 The jacket is worked in the round on circular needle after the Edge and cut mid front afterwards. Cast on 160-163-169 sts on circular needle size 3.5 mm / US 4 with blue and work Edge back and forth on needle. Change to circular needle size 5 mm / US 8 and continue in M.2, at the same time inc 32-41-47 sts evenly on round + inc 5 sts mid front for cutting afterwards (these 5 sts are not included in pattern) = 192-204-216 sts + 5 sts mid front. Continue in pattern. REMEMBER THE GAUGE! When piece measures 31-33-34 cm bind off 5 sts each side for armhole = 92-98-104 + 5 sts mid front on front piece and 92-98-104 sts on back piece. Now complete each piece separately. = 92-98-104 sts. Bind off for armhole each side on every other row: 2 sts 1-2-3 times, 1 st 1-2-2 times = 86-86-88 + 5 sts mid front. When piece measures 48-50-52 cm bind off the middle 10-12-14 sts + 5 sts mid front for neck and complete each side separately. Bind off to shape the neckline at the beg of every row from mid front (excl the 5 sts mid front): 3 sts 1 time, 2 sts 2 times, 1 st 4 times. Bind off remaining sts on shoulder when piece measures 58-60-62 cm. = 92-98-104 sts. Bind off for armhole as described for front piece = 86-86-88 sts. 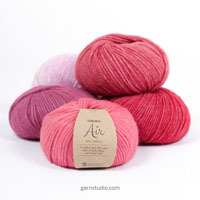 When piece measures 56-58-60 cm bind off the middle 28-30-32 sts for neck and complete each side separately. Bind off 2 sts on neckline on next row. Bind off remaining sts on shoulder when piece measures 58-60-62 cm. Cast on 36-39-39 sts on double pointed needles size 3.5 mm / US 4 with blue and work Edge. 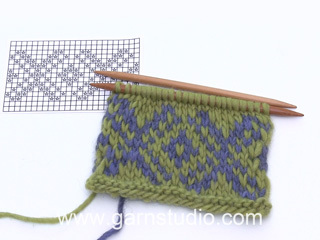 Change to double pointed needles size 5 mm / US 8 and continue in M.2 (place a pattern repeat mid upper sleeve), at the same time inc 10-7-9 sts evenly on first round = 46-46-48 sts. At the same time after the Edge inc 2 sts mid under arm a total of 23-23-24 times on * every 3rd and 4th round * alternately = 92-92-96 sts. When piece measures 45-46-46 cm bind off 6 sts mid under arm and complete piece back and forth on needle. 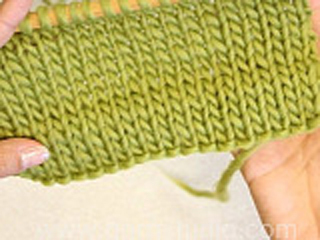 Bind off to shape the sleeve cap each side on every other row: 5 sts 5 times. Bind off remaining sts, piece measures approx 51-52-52 cm. Insert a marking thread from top to bottom in the middle of the 5 sts mid front. Sew 2 seams on a sewing machine around the marking thread, 1st seam = ½ st from the MT, 2nd seam = ½ st from the 1st seam. Cut mid front. Sew side seams. Sew the shoulder seams. 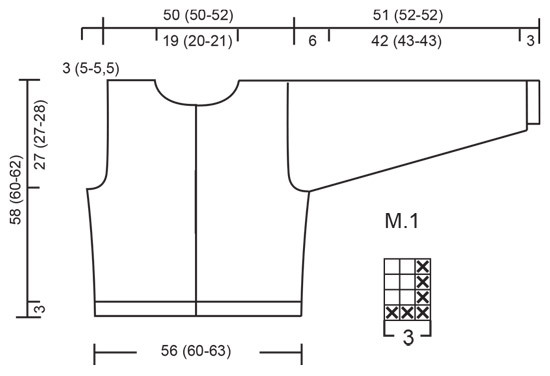 Pick up approx 90 sts along left front piece on needle size 3.5 mm / US 4 with blue and work Edge back and forth on needle as follows: 2.5 cm / 7/8'' stockinette st, M.1 from top down, change to coral, P 1 row, change to clue and work 3 cm / 1'' stockinette st, bind off. Repeat along right front piece but after 1 cm / 3/8'' make 5 buttonholes evenly distributed. 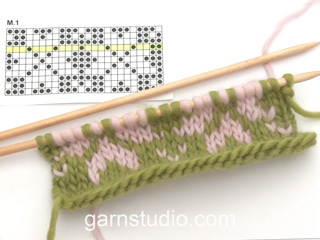 1 buttonhole = bind off 2 sts and cast on 2 new sts on return row – remember buttonholes on the piece in stockinette sts to be folded towards WS! Pick up approx 94 to 97 sts round the neck on needle size 3.5 mm / US 4 with blue and work Edge back and forth on needle as follows: 1.5 cm stockinette st, M.1 from top down, change to coral, P 1 row, change to blue and work 2 cm / 3/4'' stockinette st, bind off. Sew sleeve seam at top and set in sleeves. Fold all edges double towards WS and fasten. Sew on buttons. Dear Mrs Crofts, there are now larger diagrams for M.1 and M.2. Happy knitting!